Today is Day 2 of the tic tac toe dress blog tour! This week and next you will see eighteen beautiful dresses sewn up by bloggers from around the world. Until next Friday, you can receive 10% off the price of the tic tac toe dress (and all sewpony vintage patterns) with the code TICTACTOE10. Apply it at checkout in the sewpony vintage shop HERE. Use #tictactoedress to tag your creations. Today's bloggers are Marisa from Thirtynine, Miranda from Inspinration and Thouraya from Amelie + Atticus. Marisa is a fellow Aussie blogger who blogs at Thirtynine. I have followed Marisa's makes for a while now. She makes stunning clothes for her lovely daughter. Her poppies dress encouraged me to try one of Bambiblauw's panels to make my own panel dress. Marisa was one of my wonderful testers. She made a stunning tic tac toe dress for her petite and beautiful daughter. You can see more of the dress here and find out what Marisa used to encourage (bribe) her daugher for photographs! Miranda from Inpsinration has been a super helpful tester for me with several of my patterns now. She lives in the Netherlands and sews for her children and sometimes herself. Her garments are always stunning and I was glad to have her on board again with my tic tac toe test! Miranda made a beautiful tic tac toe dress from See you at six fabric. You have to head over to Inspinration to see more of this beauty! I just love these epaulettes! 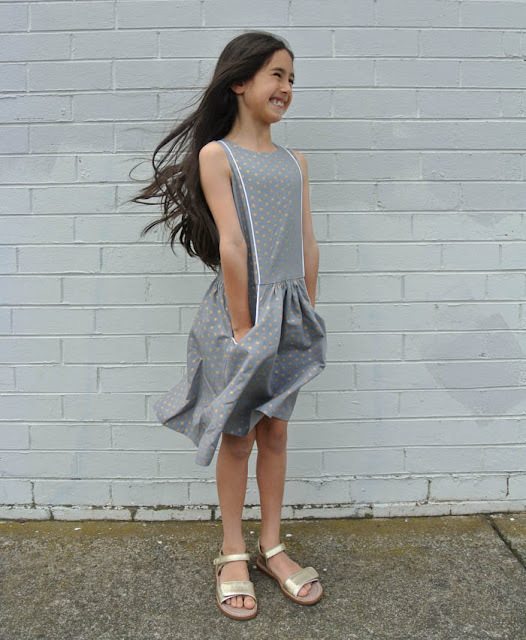 Thouraya blogs from Amelie + Atticus. I have followed Thouraya's blog for many years. She is a fellow Aussie sewist and sews beautiful thing - mostly from vintage fabrics for her three kids. I was excited to have Thouraya in my testing group and she made two sweet dresses for her daughters. The one pictured is from Strawberry shortcake fabric!! 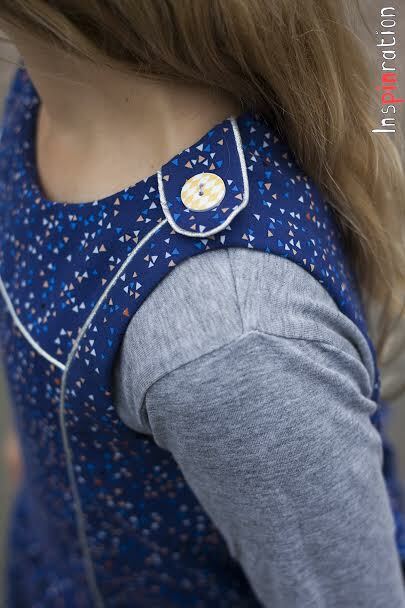 Head over to Amelie+Atticus to see this and also another sweet tic tac toe dress! Thank you so much Marisa, Miranda and Thouraya! Be sure to come back on Friday to see more beautiful tic tac toe dresses!! Make sure to search #tictactoedress on social media to see more inspiration and don't forget to tag your dresses too! It really is another great pattern Suz! My Litte daughter loved "tic tac toe dress" so much ! immediately i will buy one for her! Love this "tic tac toe dress" post of yours. Really all patters are amazing in your post whose are you mentioned richly ! The first one i like most , this looking so smart . I think my baby (7 years old) will like that so much! Wow ! So sweet!! Really I love all the floral - fabric and actual! Thank you for all your Inspiration ! The last one with red pattern is so much cute. My daughters (one is 9 years old and another one is 10 years old ) lost so much. I will try to grab the last one for my daughters. Thanks !